Nothing about the Town of Banff is ordinary. The first of only two municipalities in Canada to be located wholly within a national park, Banff is a global destination, welcoming over three million visitors from around the world each year. With stunning surroundings, a rich heritage and a vibrant community of active residents, Banff has much to share. People can now experience the spectacular scenery of this Canadian Rocky Mountain community from anywhere in the world, simply by stepping through Banff’s virtual front door. Visitors to the Town of Banff’s previous website would never know they were in Canada’s first and most famous national park. The town’s online presence lacked the visual impact of the natural splendor of Banff National Park, nor did it adequately represent the values and vision of the community. With an outdated platform and static content, the town was also unable to offer residents and visitors meaningful, engaging information or interactivity. 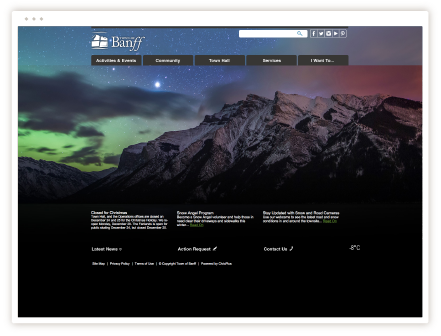 With their newly-designed website, the Town of Banff truly creates a “wow” moment for site visitors, evoking the same kind of awe that comes from physically visiting the mountain town. The site also reinforces the pride and appreciation residents have for their beautiful community. Residents can subscribe to news, access useful resources from their smart devices, check community and destination events, and connect to the most accurate and current information. Staff updates the site daily, making it the source and authority for all things Banff. And with a vigorous social media following — over 25,000 followers on Facebook alone — the Town has benefitted from being able to integrate the site and their social media platforms, resulting in even more interaction on their website.